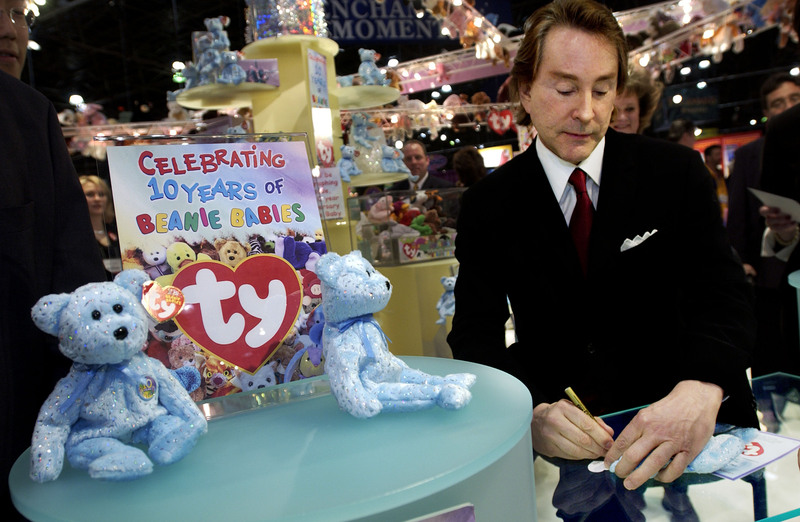 Too bad the Feds aren’t softies: Beanie Babies founder H. Ty Warner has agreed to plead guilty and pay one of the largest fines ever imposed for tax evasion: $53.5 million. His hidden hoard of money, located in a secret offshore Swiss bank account, totalled $3.1 million, or about 689 Peanut the Royal Blue Elephants. Warner went to “great lengths to hide [his income] from his accountants and the IRS,” Gary S. Shapiro, a U.S. Attorney for the Northern District of Illinois said. I gotta hand it to him: For a guy who made a fortune off of poetically inclined plush toys, he’s pretty badass about his tax fraud. Warner opened his first Swiss account in 1996, when most of us were jealously judging each others’ collections. In 2002, he transferred his money over to Zürcher Kantonalbank. By that point, the balance had reached $93,630,083, which is a lot of miniature stuffed animals, even if that bubble burst long ago. That same year, Warner earned his arresting sum of $3.1 million through investments in his UBS account. He failed to report it not once, but twice: First in his 2002 1040 filed in October 2003, and then again on an amended 2002 1040 filed in November 2007. Whoops! However, his attorney, Gregory Scandaglia, said Warner had been trying to resolve the “unfortunate situation for several years now.” In 2009, Warner attempted to enroll in the IRS’s Offshore Voluntary Disclosure Program, which is meant to give people with undisclosed offshore accounts another chance at coming clean. But then this August, around 100 Swiss banks decided to cooperate with the U.S. government by giving out the names of U.S. clients thought to be hiding money from the IRS — so that they could avoid prosecution for their cooperation. Warner's the second person to be charged so far as a result of the investigation. He also faces the maximum sentence for federal tax evasion of a $250,000 fine and five years in prison, in addition to his $53.5 million penalty and the possibility of also paying back taxes with interest on all his unreported income. Not so plush after all. Let's use this as an excuse to watch The Hunger Games reenacted by Beanie Babies, shall we?